Christmas cards don’t have to be long and detailed, and they definitely don’t need to be complicated. If long holiday letters and intricate designs with lots of color choices just aren’t your style, you’re sure to love our collection of minimalist holiday cards. Here are five of our favorite designs! A photo, holiday message and old-school letter board design, all on a single card with ribbon for hanging. Friends and family members will love this greeting card because they can hang it anywhere in their home! Letter board style introduces your holiday card, which holds several photos and your holiday message. This design is fun because it’s interactive and it holds multiple photos, which is what everybody wants to see, right? 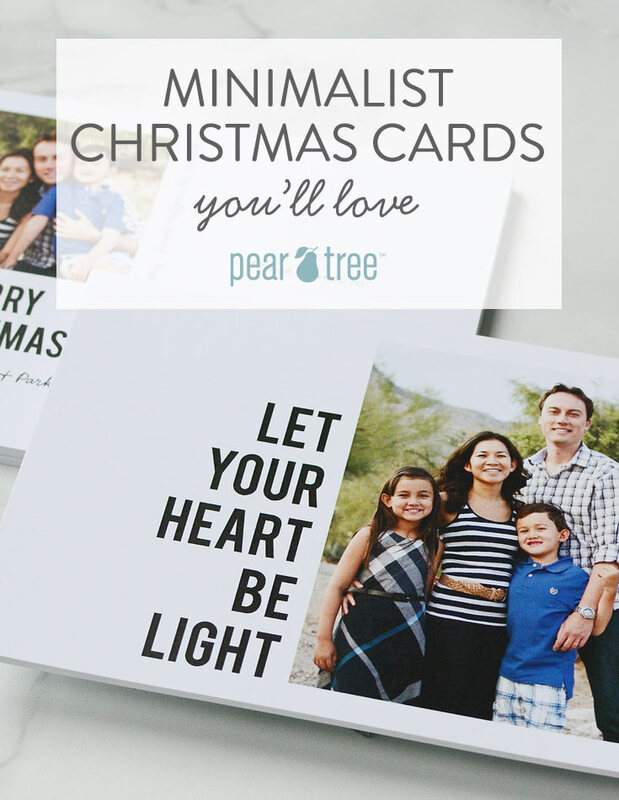 Postcards are an excellent option if you’re trying to simplify your holiday cards this year. The same chic letter board design appears with your photo on the front. Another photo appears on the back with a quick holiday message. Real foil stamping is all you really need for a festive Christmas card design. You get to choose the foil color for “Merry Christmas” below your photo. The backside of this flat card has another photo with your holiday message. A one-sided magnet with your photo and a short holiday message becomes the perfect holiday hello! Friends and family will be pleasantly surprised when they see they can display this holiday card wherever they can use a magnet. Have fun creating simple holiday cards this year that everyone you know will rave about! Pear Tree is your best bet for finding trendy designs you’ll be excited to send.